82. וַהֲרֵי בֵּאַרְנוּ, שֶׁכָּתוּב (יחזקאל א) וְהִנֵּה רוּחַ סְעָרָה בָּאָה מִן הַצָּפוֹן – הֲרֵי דַּרְגָּה אַחַת. עָנָן גָּדוֹל – הֲרֵי דַּרְגָּה אַחֶרֶת. וְאֵשׁ מִתְלַקַּחַת – הֲרֵי דַּרְגָּה שְׁלִישִׁית. וְנֹגַהּ לוֹ סָבִיב – דַּרְגָּה רְבִיעִית. וְאַחַר כָּךְ, וּמִתּוֹכָהּ כְּעֵין הַחַשְׁמַל. וְאַחַר כָּךְ, וּמִתּוֹכָהּ דְּמוּת אַרְבַּע חַיּוֹת. הֲרֵי דְּרָגוֹת בְּתוֹךְ מַדְרֵגוֹת (דְּרָגוֹת). 83. אַף כָּאן, כְּשֶׁהִתְגַּלָּה הַקָּדוֹשׁ בָּרוּךְ הוּא לְיִשְׂרָאֵל, לֹא הִתְגַּלָּה אֶלָּא מִתּוֹךְ דְּרָגוֹת הַלָּלוּ. מִסִּינַי בָּא – דַּרְגָּה שֶׁהָיְתָה יוֹתֵר נִסְתֶּרֶת, וְאַחַר כָּךְ הִצְטָרְכָה לְהִתְגַּלּוֹת. וְאָמַר וְזָרַח מִשֵּׂעִיר – הֲרֵי דַּרְגָּה אַחֶרֶת שֶׁהִיא יוֹתֵר בְּגִלּוּי, קְלִפָּה שֶׁשּׁוֹרָה עַל גַּבֵּי הַמֹּחַ. וְאַחַר כָּךְ, הוֹפִיעַ מֵהַר פָּארָן – הֲרֵי דַּרְגָּה אַחֶרֶת. וְאַחַר כָּךְ, וְאָתָה מֵרִבֲבֹת קֹדֶשׁ – זֶהוּ שֶׁבַח שֶׁל הַכֹּל. שֶׁאַף עַל גַּב שֶׁהִתְגַּלָּה מִכָּל הַדְּרָגוֹת הַלָּלוּ, מֵאוֹתוֹ מָקוֹם שֶׁהוּא עִקַּר הַכֹּל, הִתְחִיל לְהִתְגַּלּוֹת מִמֶּנּוּ. מֵאֵיזֶה מָקוֹם הוּא? הוּא מֵרִבֲבֹת קֹדֶשׁ, אוֹתָן דְּרָגוֹת עֶלְיוֹנוֹת לְמַעְלָה. (לְמַעְלָה) אַף כָּאן אֵלַי קֹרֵא מִשֵּׂעִיר – מֵאוֹתָהּ דַּרְגָּה שֶׁאָמַרְנוּ שֶׁנִּדְבְּקָה לְמַעְלָה. The Zohar quotes these verses to support the previous study that tells us that there are levels within levels in the spiritual realm. ‘a storm wind’,’רוּחַ סְעָרָה’ is one level, ‘a great cloud’,’עָנָן גָּדוֹל’ is another level, ‘fire flashing forth’,’אֵשׁ מִתְלַקַּחַת’ is another level, ‘a bright light around it (Nogah)’,’נֹגַה’ is the fourth level. Then we read ‘in its midst, …like electricity in the midst of a fire, and within it ‘four living beings’ that tells about levels within levels. When the Holy One Blessed be He revealed himself on Mount Sinai it was from within these levels. ‘from Sinai’ is the most concealed level. When the time of revelation came, it says ‘And dawned on them from Seir‘, which is another level that is more open and with a Klipa that covers its Light. ‘from Mount Paran’ is another level. Then ‘came from the midst of ten thousand holy ones’ that reveals the glory of the concealed levels. Even though the Holy One Blessed be He was revealed in all these levels, the beginning of his revelation is considered to be the level of ‘ten thousand holy ones’ that is the Holy place that is above all other levels. Malchut is the lower level of the Tree of Life but at the same time, the most important because it is where the Light of the Endless blessed be he, is revealed after a long process. The first thought that ‘pops’ in our mind is the aspect of ‘Sinai’, then through a process of engaging our wisdom (Chokmah) and understanding (Binah), we break the Klipot that blocks the Light from supporting the actions that we do in Malchut, revealing the light for our benefits and of the world around us. When we process the thoughts from ‘Sinai’ and manifest the ‘gifts’ from the Endless light (Keter) positively, we merit to receive greater and purer thoughts pop in our mind. Spoken words are an aspect of Malchut because they are a final step of expressing a thought. When we truly listen to a person words in our mind (Chokmah and Binah), then we can have a better understanding of the original thought that generated his words. A simple example is when a person talks to you or ask you about a certain subject then most likely that’s what in his mind. Obviously not when it is a professional conversation that is driven by external caused. 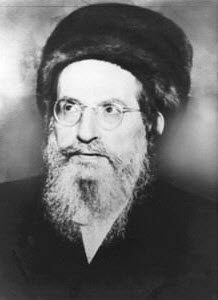 Rabbi Shimon was called ‘Sinai’ and ‘Holy Candle’ because he revealed the most concealed secrets, ‘Sinai’, of the Torah. The Torah is Zeir Anpin and the Zohar by Rabbi Shimon helps us get ‘touched’ and be purified by the light of the Endless. All we need is to ‘climb’ ‘Mount Sinai’. 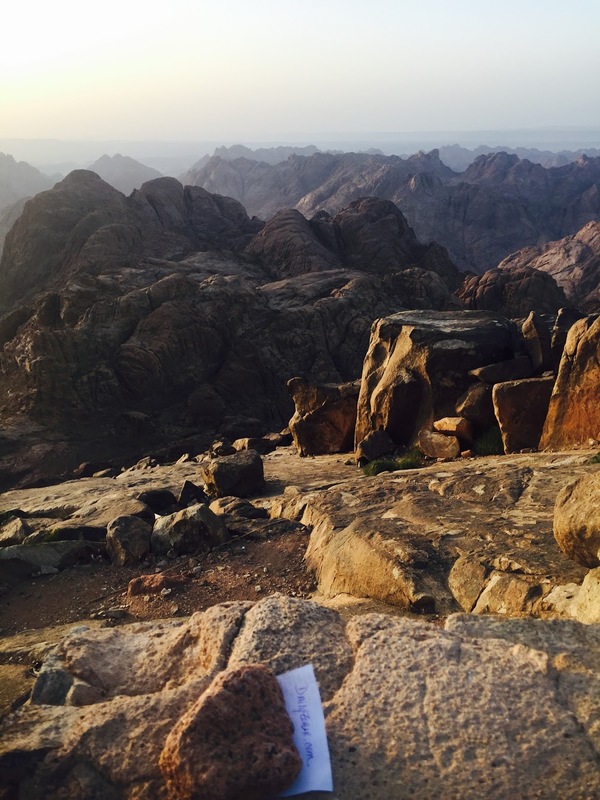 Below is a picture showing the view from Mount Sinai. The local Arabs call it Moses’s mountain. The picture was taken by a dear friend and the white paper under the rock reads “DailyZohar.com”. I have the small rock in the picture at home.